Thanks for that! I am going to travel to Florida from Australia to do Goofy 2012 so I need all the help I can get 🙂 I’m doing a full marathon in July and another one in October so that should be a good base (I hope). Bring on the Disney bling! 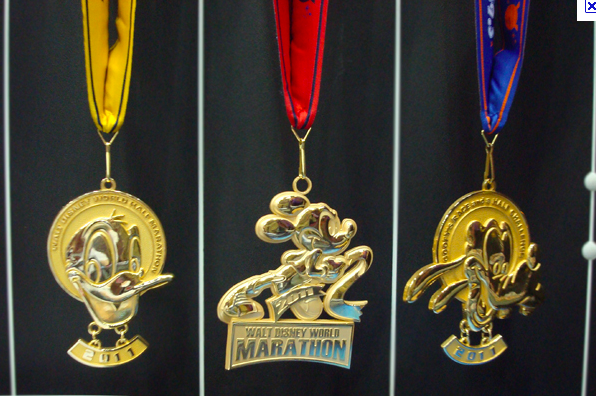 Full-marathons in July & October will be a great base and give you plenty of time to recover and keep training for Goofy! I have a full on November 5th. Good luck on your two full marathons! Thank you for this post. I’m strongly considering the dive into the Goofy Challenge for 2013 and enjoyed reading your post. The schedule will be a slight transition from my half marathon and Ragnar training, but I think it’s managable provided I can keep my bunion issues under control. Hi Angela – Surprisingly the Goofy training is very similar to training for a standard marathon except you have planned “Goofy Weekends” where you’ll do a double long run. These build throughout the program until you’ve almost done the real deal then it’s taper time. 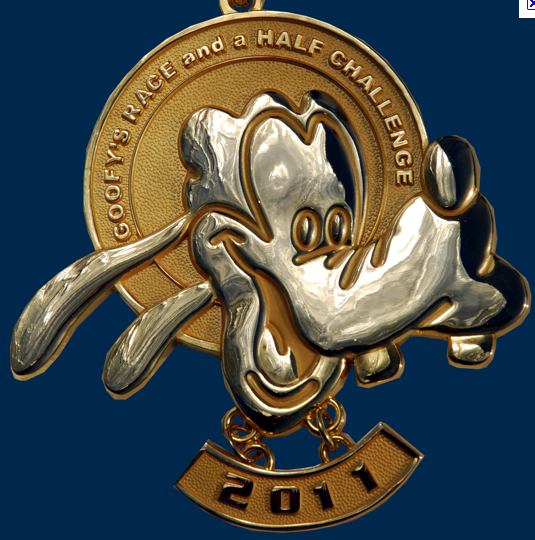 I’ve heard others say they just train for a marathon and go for it on day 2 of the Goofy. I liked having some double runs to simulate the experience and learning to run on tired legs. Good luck in your Goofy training! I can also hook you up with a great charity running team if you’re interested. It’s a great race and a lot of fun! I’d like to learn more about the charity team. Regarding the training, I have yet to run a full marathon. I’ve always been too scared to try it. I’ve become pretty comfortable with the half marathons, even paced for one last month. BUT, friends who have ran the Goofy tell me my training is strong/consistent enough to handle the increase. Honestly, I put in more miles on my normal weekly training than on your schedule and I too like the idea of building up to the day using a mock run approach. Ragnar does the same thing and it was very helpful. I’ve also realized my body responds better when running fewer days and cross training on the other days. I’m made a few minor adjustments to your proposed schedule and filled in all of the holidays, etc. so I’m good to go. I plan to space out the super long runs to just once every 3-4 weeks. I have also factored in some buffer time for the inevitable sick days/weeks and a couple of half marathons I’m registered for in November. With that said, I will start my Goofy training in mid-June, right after finishing Ragnar Chicago! My biggest concerns are the weather on race mornings at Disney, getting rest the night before (since I’ll be traveling with my family/children), and handling the early start to the start line (needing to eat, feeling like crap, etc.). After my Ragnar experience I realized that if I can manage to run on zero sleep for two days while helping my team navigate from runner exchange to runner exchange, I can certainly manage more than what I’m doing now. I look forward to hearing back and learning more about the charity team. We support the Make a Wish Foundation for a lot of Disney races. There’s all sorts of things to consider for a Disney race. Are you going for a vacation too? I’d do it AFTER the races if so that way you’re not inclined to walk around the parks and become exhausted for the races. I was so excited for my 1st marathon there I barely got 2-3 hours of sleep the night before. It was just my wife and I so logistics were easier. If possible financially stay on property at Disney (WDW). Getting to the race start is 100x easier. I’ve done both and was still sitting in traffic the morning of the half marathon with 25 minutes til the start gun. I became “that driver” and got there in time. 🙂 Getting there via a disney bus is a LOT easier than driving in from off property…go as early as you can to each event though the half marathon is the biggest event of the weekend. The weather starts off cool/colder and then warms up quickly when the sun hits. I was fine with a longer sleeved shirt with a short sleeve over it and shorts. One year I know of the weather was horrendous. In 2010 there was sleet/snow on both mornings of the race and the temps were in the 20/30s. It was miserable, but people did it…not me…I wasn’t there. That kind of weather is NOT the norm, but people still talk about it to this day. Hope this helps! I’m happy to answer more questions if you have them! LOL… yes, I’m FULLY aware of the rapid changes in weather here in FL since I live in north central FL. It’s crazy! We do plan to stay on property, but even that, I hear, still leave the half marathon morning a madness. I do fret about the super low temps and I do remember friends running the Goofy in 2010. I was SO glad to be staying in bed that morning. Thanks for the link. I’ll send more questions in time. Ah! A Floridian! This Northerner is jealous. As long as you plan to be awake and on the first bus out of your resort for the start line then you’ll be fine. That’s what I did in 2011 and I had plenty of time and no worries. Once you’re to the start line then it’s just standing around…grab a cup of coffee and wait. If you do decide to go with the WDW Radio Running team they are a lively group and will keep you company!